It is with great sadness that we announce the passing of James (Jim) Riley Buchannon “BUCK”, July 29, 2018 at age 78. Jim was born in Dauphin October 2, 1939 to parents George Edward Buchannon and Edna Gladys Buchannon (Barker). Jim married his beloved wife Florence Sainsbury, daughter of Herbert and Winnifred Sainsbury (Hodges) on May 19, 1962 at the First United Church in Dauphin. Jim had 14 years of dedicated service to the Dauphin Fire Department; he was a member of the Royal Canadian Legion for 50 years. 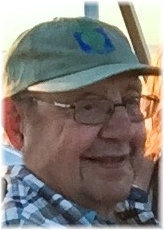 He was employed at the Manitoba Department of Highways December 1964 to March 1996. Jim was active in the Manitoba Civil Service negotiations, as a leading member of Trades, Operations and Services Component. He also served as a member of the Masters Agreement Negotiating Committee. He was a member of the Union’s Board of Directors as well as being elected as one of the Provincial Officers of the Union. He was a strong voice in representing workers and spoke from the heart. He was down to earth and tried to use common sense as much as he was able. Jim was always available to help at fishing derbies or hop in a combine when he wasn’t wrapped up in his Louis L’Amour books or sitting at the scrabble board. Jim took great pride in the recognition and acknowledgement that the Town/City of Dauphin showed his uncle, Lt. Col. “Billy” Barker over the years. He enjoyed travelling with his friends and family and experiencing the amazing destinations of Hawaii, Mexico, Palm Springs, Alabama, St. Maarten and Alaska. He also camped with the family from the West Coast to Ontario and enjoyed hunting, fishing and spending time at “The Ponderosa,” their acreage near the Duck Mountains. Jim loved spending time with his grandkids on the water, on the ice and sitting around the fire or kitchen table. Jim is lovingly remembered by his wife Florence, his daughters Barb (Gerald Michaluk) of Devon, AB and Donna (Dean Ouellete) of Winnipeg, MB; grandchildren Matthew Jacques of Winnipeg, Chris Jacques of Devon, AB, Kaitlyn Cameron (Scott) of Sherwood Park, AB and Logan and Nikki Michaluk of Devon, AB; great grandson Miles Jacques son of Matthew Jacques; sister Janice Wilson of Wawota, SK; brother Wayne Buchannon of Winnipeg, MB; sister-in-law Winnifred wife of brother Jack; and by nieces and nephews who he shared many good times with. Jim was predeceased by brothers, Ken, Jack and Don Buchannon and sister Barbara Wolfe and brothers-in-law Arnold Wolfe (Barbara) and Winston Wilson (Janice) and sister-in-law Shelly (Wayne). If friends so desire, donations can be made to Cancer Care Manitoba.